Nearly a century later, the number of elected representatives with military experience is small; in the 41st Parliament, 13 of 308 members in the House of Commons. Canadian military personnel and veterans’ lack of success in electoral politics suggests that a military career makes for an uneasy transition into political candidacy. The current federal election campaign does demonstrate, however, that veterans’ issues can emerge as key policy issues. Once thought to be a reliable Conservative Party constituency, veterans now represent a potential swing voter group. Highly critical of Harper Government cuts and its perceived indifferent attitude, some angered veterans have formed an “Anyone But Conservative” campaign. Their activism has attracted considerable media attention, and you can find the group on Facebook. The major parties have also recruited a number of high-profile military members as candidates in part to bolster creditability on the issue. 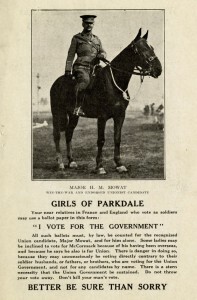 During the First World War, a large body of soldiers and veterans were in a position to influence a federal election for the first time in Canadian political history. 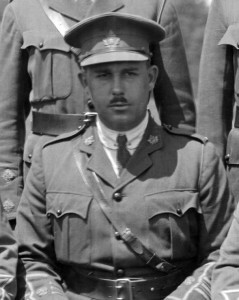 By the December 1917 campaign between Prime Minister Borden’s Union Government and Laurier’s Opposition Liberals, a growing demand by the English-Canadian public to support veterans and win the war compelled a number of returned men and serving soldiers to assume an active role in electoral politics. When the Toronto branch of the GWVA met days after the election which saw all independent soldier-candidates go down in defeat, one member demanded the Prime Minister explain whether “there is a genuine desire on the part of the Unionists to keep us out of Parliament or not.” Others protested that the names of soldier-candidates had been omitted from lists cabled overseas thereby deceiving troops as to who was running in which riding. Bitter over the contentious campaign and the opposition of many returned soldiers, Mowat continued to complain about McCormack’s candidacy from the House of Commons. His attempt to sympathetically characterize the attitudes of his rival’s supporters struck certain MPs as belittling and condescending. “[S]ome of them have come back maimed or nervous as a result of shell shock,” Mowat observed, “The trouble is that being nervous and somewhat sentimental they are apt to be misled…” Fellow MPs who had actually served on the front resented the implication that returned soldiers were unstable and overly-emotional, and interpreted the remarks as further evidence civilian politicians could not understand the attitudes of veterans or appropriately address their grievances. If the candidacy of soldiers in 1917 signalled a new importance of veterans in Canadian politics, it also represented the first exploitation of veterans’ issues for political gain. In the years after the war, many veterans became disillusioned with government promises and again called for a stronger voice in parliament. Soldier-candidates who ran for the Liberals in 1921, however, found themselves under attack by the same Conservatives who had, during the war, vowed to support any returned soldier regardless of party affiliation. In the present, as Canada copes with the costs of the Afghanistan mission and continued military involvement in the Middle East, the First World War provides important historical context for the electoral politics surrounding veterans’ issues. As many returned soldiers suspected during the 1917 campaign, elected representatives cannot necessarily be expected to make informed and thoughtful policy decisions if so few have a personal stake in how government actions, funding priorities and spending cuts directly affect veteran populations. “Soldier Members and Senators Give After-War Views,” Ottawa Citizen, 3 May 1923, 5. The 2015 candidates who served in the Afghanistan mission include: Harjit Sajjan (Vancouver South), Andrew Leslie (Orléans), Jeff Lehoux (Renfrew—Nipissing—Pembroke), Tim Laidler (Port Moody—Coquitlam) and Marc Dauphin (Sherbrooke). Unsuccessful 1917 soldier-candidates who ran as independents included: Lt. Col. Donald Sutherland (Oxford North), Major Ross Cockburn (East York), Lt. Col. Harry Cockshutt (Brant), Lt. Col. John McLaren (Hamilton West) and Major Carson McCormack (Parkdale). Toronto Globe, 11 Dec 1917, 8. Toronto Globe, 6 Dec 1917, 8. House of Commons. Debates (18 Apr 1918), 915. Toronto Globe, 15 Dec 1917, 13. “13th General Election, 1917,” Sessional Papers of the Dominion of Canada, Vol. 4 (Ottawa: Thomas Mulvey, Printer, 1920), 78. “Why did Premier Endorse Soldiers’ Rivals,” Toronto Star, 20 Dec 1917, 20. Debates (18 Apr 1918), 909.